Corey Hamm – The People United Will Never Be Defeated! Since arriving in Canada from Tehran in 2001, composer Farshid Samandari has become a mainspring of the Western Canadian music scene, acquiring his doctorate of music in 2014 and, in 2013, becoming composer-in-residence for the Vancouver Inter-Cultural Orchestra — a position that has allowed him to build bridges with musicians and artists all over the world, and help make Vancouver the intercultural hub that it is. While this album is primarily focussed on Samandari’s chamber music, it provides an excellent overview of those things that inform his work in general: Persian classical music and literature, Japanese noh theatre, European avant-garde, even physics. The confluence of these seemingly disparate sources fuels his unique voice and inspires his personal maxim, “Unity in Diversity.” Moreover, each piece is deeply autobiographical. Exile, wandering, the search for a home (both physical and spiritual), and the triumph over adversity are all recurring themes. To this end, the flute takes on a particularly important role in this album: it is the artist’s voice, it is the listener’s guide through unfamiliar landscapes, and it is the bridge that connects old and new worlds. Apogee (2005) for solo flute is the first major collaboration between Samandari and flutist Mark Takeshi McGregor. 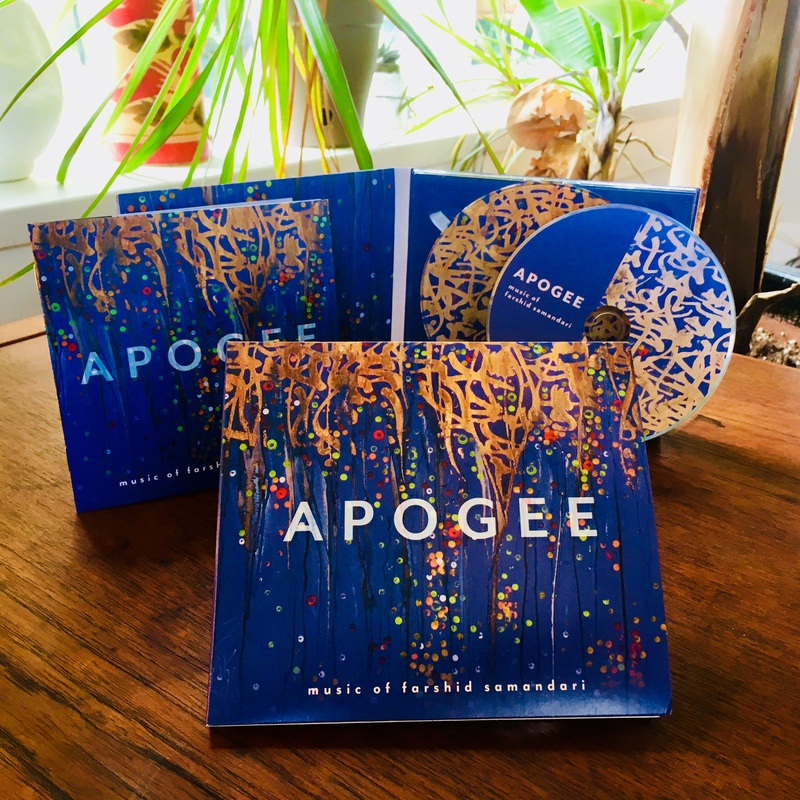 In the composer’s words, Apogee tells of a journey “from innermost earth to utmost orbit” — but in keeping with Samandari’s love of contrasts, this futuristic sojourn is described with ancient tools. Apogee borrows from classical Persian scales and modes — specifically “four tempered gushehs (short phrases) which mold a new maqam (longer melody).” The flute itself constantly morphs between states: at one moment it is a virtuosic exponent of contemporary utterances; at another it hauntingly evokes the sound world of the Persian ney (wooden end-blown flute). Nuclide (2014) is Samandari’s second solo flute work, building on both Apogee’s scope and virtuosity. The initial inspiration was, in fact, the nuclide — “a distinct atom with its static protons and fast moving electrons that can easily evolve from one form to another.” To this end, the flute blurs from conventional sound to extended sound, or often from one extended technique to another. Harmonics, whistle tones, and multiphonics form the groundwork of softer, febrile passages while flutter tonguing and overblown attacks punctuate the more bellicose moments. From Fire to Water (2015), in the composer’s words, “delves into the human psyche. It depicts one’s journey from a fiery self to a calm, soothing character.” In the spirit of Samandari’s interest in pitting tradition against modernity, the work’s three movements allude to Persian modal music from various eras while being scored for the rather contemporary combination of alto flute, viola, harp, and percussion. As with any personal transformation, From Fire to Water encounters its share of mood swings and growing pains, with the central movement providing some of the piece’s most involved narratives.